Cohesity, a company that helps enterprises to store and manage all of the secondary data they create outside of their production apps, today announced that it has raised over $90 million in a Series C round led by GV (aka Google Ventures) and Sequoia Capital. Sadly, the company’s investor’s won’t let it disclose the exact number, except that it’s over $90 million (and our understanding is that it’s under $100 million, too). Cisco Investments and HPE also participated as strategic investors, as well as Accel Ventures, ARTIS Ventures, Battery Ventures, DHVC (formerly Danhua Capital), Foundation Capital, Qualcomm Ventures, Trinity Ventures and Wing Venture Capital. “Hyperconverged” is probably my least favorite enterprise buzzword, but it essentially means that you use a single commodity server for storage, compute and networking. In the case of Cohesity, the focus is mostly on the storage of what it calls “secondary data,” that is, backups, test/dev copies and analytics data — the inevitably massive data exhaust of running any major application in production. 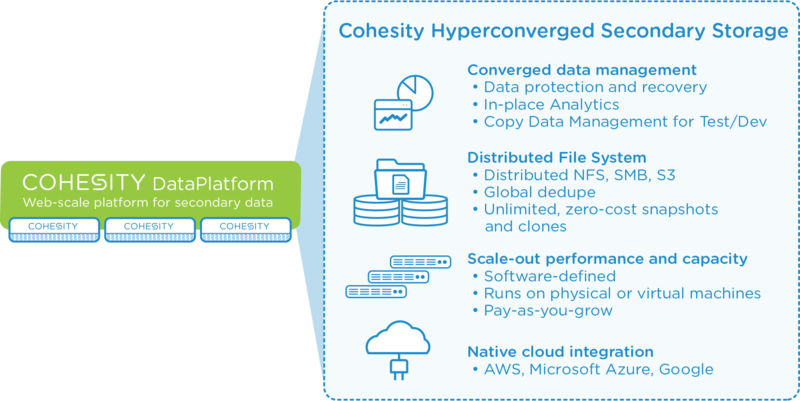 The Cohesity platform includes both the company’s own appliances as well as the software tools that can integrate with the major public cloud platforms to manage and analyze the incoming data.